Hollywood once again takes you back to the 1940’s… Adolf Hitler has risen to power. The European nations are in turmoil. And Dunkirk is in danger. Darkest Hours tells the story of Winston Churchill (Gary Oldman) as he tries to navigate the political quagmire of parliament and his political enemies. Over a number of days, we see Churchill’s struggle as he has to make tough decision after tough decision. This biographical war drama is ripe with leadership lessons, so let’s get into leadership lessons from Darkest Hour. Parliament had lost faith in their current Prime Minister, Neville Chamberlain (Ronald Pickup), and demanded his resignation. They felt he was not strong enough to protect the national security of Britain. This is what happens to bad leaders. Someone wakes up and realizes the person in a leadership role isn’t doing their job. They then make the tough decision to remove the ineffective leader and choose someone to succeed them. Be aware of how effective you are as a leader. The less effective you are, the greater the chances are you’ll be replaced before your time is up. I appreciate your confidence in me. However, my time has not yet come. After the resignation of Chamberlain, he tells the Conservative Party he would like Edward Wood, 1st Earl of Halifax (Stephen Dillane) to succeed him. Halifax tells the Conservative Party he must decline. His time has not yet come. This is a great leadership lesson from Darkest Hour on knowing when the right time is to step into a position of leadership. You have to be ready to be a leader. You shouldn’t step into a leadership role if you’re not prepared to do so. Winston Churchill was rude to his new secretary Elizabeth Layton (Lily James). He verbally reprimanded her for not following his instructions. His words were so harsh Elizabeth Layton left his office and almost quit. Winston’s wife Clementine Churchill (Kristin Scott Thomas) saw how he had treated Layton. She thought his actions were rude and unkind. And she let Winston know he had changed. Leaders need someone like Clementine Churchill in their life. They need someone who’s willing to be blunt and tell them the truth. Avoid the temptation to surround yourself with “yes men.” Instead, surround yourself with people who aren’t afraid to be honest with you. Churchill’s brutish attitude towards Layton made her want to quit. His attitude impacted her in a negative way. Later in Darkest Hour, we see how Churchill uses a positive attitude to rally the people of Britain. He gives a speech full of positivity and hope. They believe him. Attitude matters in leadership. Make sure you’re checking your attitude indicator. Early in Darkest Hour, you see Winston Churchill doubt whether or not he had what it took to be Prime Minister. He questioned why he was chosen to lead. Was it revenge? Did people want to see him fail? He couldn’t wrap his mind around the fact he was qualified to lead. You may just be starting your leadership journey. You may even wonder why someone chose you to lead. I can’t blame you. Being chosen to lead will lead to doubts. You’ll wonder why and how and what’s to come. You’ll doubt but you have to push through those doubts. Great leaders doubt. But great leaders also push through those doubts. The sitting Prime Minister, Neville Chamberlain, voiced his displeasure with Churchill’s appointment as Prime Minister. He didn’t like Churchill and the blunders he’d made in the past. He felt Churchill made too many mistakes to lead effectively. Still, he chose Churchill to lead. Your time as a leader won’t be perfect. You’ll make mistakes and blunders. Those mistakes will cause people to doubt you and not want you to lead any longer. Be ready when opposition comes. You will have people who don’t want you to lead. Show them why you deserve to lead. You have an enormous task ahead of you. Sir Anthony Eden (Samuel West) reminded Churchill of the enormous task Churchill was facing. He had the weight of a country on his shoulders. Leading a country is a task that’s hard for anyone to do. And it was all on Churchill. You have an enormous task ahead of you, as well. You are tasked with leading those you’ve been entrusted with. And you also have the responsibility to lead your organization, business, or church in the right direction as well. Churchill had to put together a war cabinet. He chose to invite people who opposed and disagreed with him to be a part of the cabinet. Churchill knew his war cabinet would be stronger if there were people who were willing to stand up to him. Much like Churchill, you’ll have the opportunity to choose who will be on your team. You’ll be tempted to choose only those who agree with you. This would be a costly mistake. Choosing team members who disagree with you will challenge you and make you think about the choices you make. Don’t be scared to bring on opposing ideas. There will be times when you feel like you have nothing to offer. You can’t stop leading because of the feeling. You have to continue to lead until you remember what you can bring to the table. Clementine mentioned to Churchill their family was broke. Churchill was walking through the room with other team members when Clementine mentioned the matter. When she repeated it, Churchill pushed the team members out the door and closed it behind them. Churchill recognized he had a private matter to deal with. The financial problems of the Churchill family weren’t a public matter to his team, he knew the matter was between he and his wife. Our world has become a much less private place these days. Social media gives us the opportunity to shout our troubles out to the world. We work closely with our teams, it’s also easy to share our private struggles with them. While you want to be open with your team, know there are matters you shouldn’t discuss with them. Know what matters are public and which are private. In 1940, Churchill gave his first speech as Prime Minister. The speech: Blood, Toil, Tears, and Sweat, was a powerful speech. Darkest Hour made the speech an even more powerful one with the 5-10 seconds of silence before he spoke the following words. That silence lent a weight, a power that wouldn’t have been there had he began speaking right when the radio went live. Dead space, silence, is often feared by public speakers. People want to fill every gap with audio. Filling in every piece of silence takes away from your message. Use silence to make your point. Don’t be afraid of silence. Silence can be a powerful tool to convey your message. Photographers snapped a picture of Churchill as he was exiting a building. He didn’t want to speak to them so he flashed a V with his fingers. When Churchill was told of his blunder, he didn’t get angry. Instead, he found humor in his mistake. Everybody makes mistakes. Even leaders. When you make a mistake, you can either beat yourself up over it or laugh and move on. Choose to move on. The public needs to be led, not misled. King George VI (Ben Mendelsohn) called out Churchill on his address to the public. Churchill had chosen to offer a rosy picture to the people of Britain. His words misled the people, on purpose but also knowing he wanted to inspire. The George VI knew the people needed to be inspired. They also needed the truth. You can’t lie to people and expect them to continue to follow you. Be careful in how you frame what’s going on in your organization. Don’t mislead your team. Watching Churchill’s time as Prime Minister play out in Darkest Hour was hard. Hard because you were watching the decisions made in a time of war. Some of those decisions led to the deaths of thousands of men. Churchill had to make a decision. There were 4,000 in Calais, France. He could leave them there or send them to try to assist the 300,000 men trapped in Dunkirk (find out more about Dunkirk with this leadership lessons from Dunkirk article). He ordered the men to go… And they suffered heavy casualties. Making tough decisions is the job of a leader. Churchill had to. You will have to make tough choices as well. Be ready to make them when the time comes. Churchill knew what his decision to send the troops from Calais, France to fight the Nazis would do. With the knowledge he was sending 4,000 men to their death, Churchill was willing to take responsibility. He wasn’t going to shirk his part in it. As a leader, you can’t shirk your responsibility when making a tough call. You have to OWN your choices. Take responsibility. It’s what leaders do. People were dying. The Nazis were marching ever closer to Britain. Churchill was at a loss. So he did what a great leader would do. Winston Churchill asked for help. He called Franklin D. Roosevelt to ask if the United States could lend Britain some Navy ships. His request was denied but he still was willing to ask for help. You need to be willing to reach out to friends and other leaders when you’re facing hard times. You have to be able to ask for help. Surprising things happen when you ask for help. People say yes. The men at Dunkirk didn’t have much hope of surviving. Churchill couldn’t get the Navy ships in to save them. But Churchill did have a crazy idea. He would call on civilians with boats to come to their rescue. This civilian mission was called Operation Dynamo. Hundreds of boats heeded the call of the Prime Minister and their government to help. Help they did. People may consider your ideas wild and crazy. There’s no reason your idea should succeed. Know that crazy ideas can and do work. Don’t be afraid to try something people say will never work. I am most terribly (afraid). As Winston Churchill is talking to King Geroge VI, he is asked if he is afraid. Churchill doesn’t hide, he admits he is afraid… Terribly afraid. Leadership doesn’t require you to be fearless. Leadership requires you to lead through the fear. When fear creeps in, admit you’re afraid. Then move forward. King George VI didn’t have Churchill’s back to begin with. He thought Churchill was a terrible choice for Prime Minister. Over time, King George VI saw Churchill in a new light. He saw what Churchill could do: Strike fear into Adolf Hitler. Churchill’s enemy became an ally. You may have the thought to write off those who hate you. Don’t do that. Instead, continue leading well. Doing so will give you an opportunity to turn an enemy into a friend. Go to the people. Let them instruct you… Tell them the truth. King George VI knew what Churchill had to do. He had to hear from the people if Churchill wanted to make the best decision he could. When Churchill went to the people of Britain, he was able to hear from them firsthand. Their words inspired Churchill to reject peace talks with Germany and Hitler. Your people are on the front line. They see and know things you do not see and know. Be willing to sit with them and listen to their concerns. They will help you see with new eyes. Parliment was against Churchill. They wanted him gone. But when Churchill gave his “We shall fight” speech, he changed the hearts of his opponents. The words he spoke were carefully chosen. They hit home. And they made a difference. Be wise with the words you choose to say. Learn how to craft a compelling argument with your words. You can move hearts and change minds when you choose the right things to say. You will also inspire people to greatness. Those who never change their minds, never change anything. Leaders grow and change. They learn new leadership lessons they didn’t know before. And, thus, they change their minds. Don’t be afraid if your ideas and opinions begin to change. This changing of your mind is a sign you’re growing. Question: Have you seen Darkest Hour? If you have, did you take away any leadership lessons from Darkest Hour? 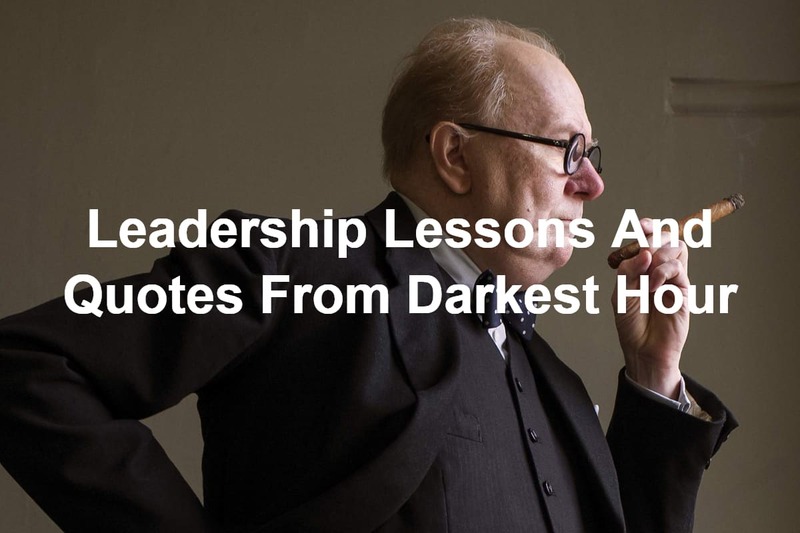 If you haven’t seen Darkest Hour, what was your favorite leadership lesson from Darkest Hour that I shared? Let me know in the comment section below.